A few hours ago in Cape Canaveral, Florida, the American Astronautical Society (AAS) named Whatever Happened to the World of Tomorrow? winner of the 2009 Eugene M. Emme Award for Astronautical Literature for Young Adults. And I wasn't there. Between workload and finances and other things, I decided I couldn't make the cross-country trip to the AAS Annual Conference. But I do get to put that nifty gold-foil sticker (above) on my book, and understand that a plaque will be on its way to me soon. I very sincerely regret that I couldn’t be there to accept the Emme Award for my book, Whatever Happened to the World of Tomorrow. This recognition means a lot to me, particularly since it is the first Emme Award given for Young Adult Books. The books I read as a boy and teenager made me an amateur astronomer, physics major, environmental chemist, and science writer. They made me fall in love with science long before I ever took a real science class. The powerful influence of good books on young minds is important and worth recognizing. And the idea that my book might help educate and influence someone reading it today, young or old, is the most gratifying honor I can imagine. When I visualized saying that in person, I always followed with a list of the books that were most important to me when I was young, most of which I still have. The Universe and Mr. Einstein (Barnett), Red Giants and White Dwarfs (Jastrow), Mariner IV to Mars (Ley), One Two Three Infinity (Gamow), Cosmos (Sagan), and scads more. If I were feeling impish, I might've even mentioned You Will Go To The Moon (Freeman and Freeman). They made a difference in my life, and if I had to distill what I hope both my books accomplish into one sentence, it'd be that they make a difference in somebody else's. That's pretty sappy but I'm standing by it. 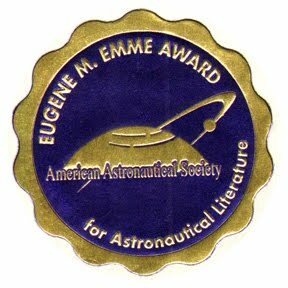 Thanks again to the AAS, I appreciate the Emme Award probably more than you can imagine. Oh, that's not sappy at all. And I'd bet that your hope for what both books accomplish has already been fulfilled. You were born a bit after I was at a time when that "bit" made a big difference in space science and astronomy -- but our lists of books that were influential to us when we were young share at least one entry in common. Jastrow's Red Giants and White Dwarfs was huge for me, even though I was already a freshman in college when it came out. Before then -- when my passion for astronomy was first being kindled -- the two most influential for me were probably Bart and Priscilla Bok's The Milky Way and Henry Paul's Telescopes for Skygazing. The latter was written by the guy who first showed me what Jupiter looks like through a telescope. He was a local amateur astronomer in my hometown, and the husband of my mom's research director for many years in the biochemical research division of Eaton Laboratories. The heart of science is imagination: the ability to see beyond the present into the possible. It's books and stories that motivate the young (and old, too) to ponder how to turn the not-yet into reality. You Will Go To The Moon was a springboard for considering space as part of my future. Putting aside the idea of a bunch of strange adult men in khakis and Florsheims showing no reluctance to sharing a spaceship with an 8-year-old boy, the possibility that there would be an intermodal system of travel from the Earth to the Moon fascinated me. I read Rockets, Missiles, and Men in Space by Willy Ley, and shuddered at the horrendous technical errors of the Nugget Library's We Land on the Moon (even in the 3rd grade, I could tell a Titan from an Atlas). Chesley Bonestell's The Conquest of Space made it seem as though we'd already been to the Moon, and somehow brought back vivid oil paintings of Aristarchus Crater as seen through the cockpit of the Millenium Falcon. These books formed a chain of imagination - - a chain that continues through your own work. I'm sure there will be future McCalls and Bonestells and Fies who will write and draw about what can be our future. Thanks again for adding links to that chain. I've always felt the hope that my stories as well as career days and other things I've done with schools and kids would set off some kind of quiet bombshell inside a kid, and not necessarily the one who asked all the questions and seemed excited at the time. The one in the back, who just said, "huh," but then pondered it all later, as he walked home or lay on his bed looking at the ceiling. You really never know what is going to make a difference to that kid, and the best you can do is keep strewing thoughts in his path like the fellow in the parable, sowing seeds on the theory that enough of it will take root to make the effort worthwhile. You've been given a very large sack of seeds, and awards like this only add to it. Keep strewin' them, my friend.